The Hotel does not have a private beach but it provides direct access to the famous Jumeirah beach and offers convenience for business and leisure travelers with easy access to the Dubai-Abu Dhabi highway (Sheikh Zayed Road) and being close Dubai Creek Dubai Museum and traditional spice and Gold Souks are easily accessible, Dubai Mall (the largest mall in the world), the Mall of the Emirates, the rapidly developing Dubai Marina and the Palm Jumeirah . Holiday Inn Express Jumeirah is in close proximity to the bus station that leads you directly to Dubai Gold Souk and Dubai Creek. 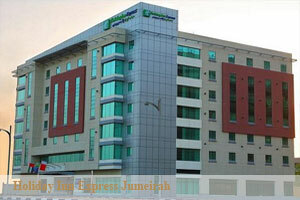 Holiday Inn Express Jumeirah features 193 contemporary style bedrooms individually air conditioned, offering guests a comfortable, warm and friendly stay. All rooms have en-suite facilities, power shower, direct dial telephones, work station, mini fridge, safe box, satellite T.V. and underground car-park facilities. Holiday Inn Express Jumeirah is committed to offer guests the best product combining convenience of location with the quality and value for which Holiday Inn Express brand is famous for around the world. The Hotel is located in the fashionable Jumeirah area close to the major business district of Dubai, incorporating the Burj Dubai, Dubai International Financial Centre, Business Bay and Dubai World Trade Centre. For more information about the hotel Click Here!